There were just short of fifty police officers providing a cordon of protection around Hammersmith Town Hall today but Mayor Boris Johnson (Con) still arrived and left the London Regional Conservative Party Conference through side doors. What he was afraid of was hard to tell. 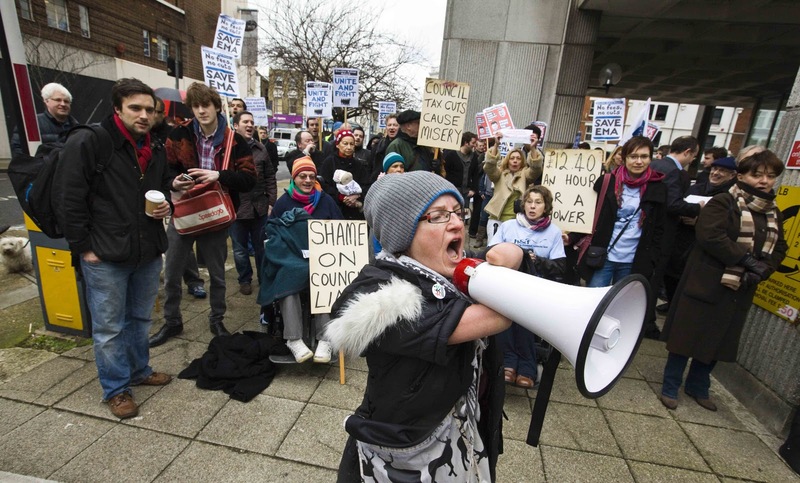 Was it the disabled people objecting to H&F Conservatives putting lives at risk; or parents objecting to the closure of Sure Start; or was it the other Hammersmith residents objecting to the £35 million Town Hall monstrosity the Administration is trying to force on the people of our Borough? One thing was clear. Mayor Boris Johnson didn't feel up to meeting them. Indeed, one photographer told me that the Mayor was so nervous when caught sneaking out of the Town Hall from a disused delivery entrance that he nearly fell off his bike when another photographer ran to capture the moment on film. Parents and students campaigning to Save Education Maintenance Allowance were there along with a wide assortment of other protest groups. Andy Slaughter MP (Lab) and several of my fellow Labour councillors attended to show their support for local residents. Later the police told me they had been very happy with how the 150 strong crowd had behaved while asserting their objections to the Conservatives' agenda. Many of the residents there were surprised that not one single Conservative politician would engage with them. They had wanted a chance to explain their views and thought they would be listened to. One senior police officer told me he roughly estimated the cost of the large police presence at £15,000.00 of public money. So it's hard to understand why Boris and other leading Tories didn't think the tax payers that had attended today at least deserved to a chance to have their concerns heard and noted.